Don Malarkey is a true American hero and an Oregon member of the “Band of Brothers”. He served with distinction in WW II with the 101st Airborne “Screaming Eagles” and parachuted into Normandy on D-Day. During his time in the service, Don met Dwight Eisenhower and Winston Churchill, and was awarded the Bronze Star. Don grew up in Astoria, Oregon and he was in his first semester at the University of Oregon in 1941 when the Japanese attacked Pearl Harbor. He became a member of “Easy” Company, 2nd Battalion, 506th Parachute Infantry Regiment of the 101st Airborne Division. He went to England in 1943 to participate in the largest amphibious invasion in history: D-Day. In the darkness of the morning of D-Day (June 6, 1944), Malarkey parachuted into France with his unit. Later that day, he received the Bronze Star for his heroism in a pitched battle to knock out a German artillery battery; an action now called the Brécourt Manor Assault (which is still taught at West Point). He fought in Normandy, Operation Market Garden in Holland, the Battle of the Bulge (surrounded in Bastogne), Haugenau, France, and the Ruhr Pocket in Germany. Never seriously wounded, Don served more time on the front lines than any other member of Easy Company. 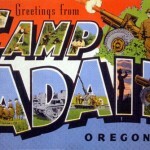 After the war, Don returned home to Oregon. In 1987, Don was introduced to author and University of New Orleans Professor of History Stephen Ambrose at an Easy Company reunion in New Orleans. In 1989, Don traveled with Ambrose and other members of Easy Company, including Richard Winters and Carwood Lipton, to various sites where they had fought in Europe following the D-Day invasion. The oral history and first person recollections that Malarkey and the others provided became the basis for Ambrose’s book Band of Brothers, which was published in 1992 – and which later was made into an HBO mini-series (2001). During Ambrose’s collection of anecdotal information for the book, Malarkey told of the saga of the Niland brothers of Tonawanda, New York, how two had died on D-Day and another was presumed killed. Fritz, one of the four Niland brothers, was close friends with Don. This episode was the impetus for the screenplay of Saving Private Ryan. Read more stories or submit your own here. During World War II, I flew a special P38 plane on daily spy missions to Germany from an air base in England. My plane was fully equipped with cameras to monitor enemy troop movements on the ground. 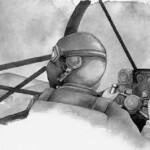 One cloudy day as I flew back to the base, the flight instruments on my plane quit working. I tried everything to keep the plane from stalling, but it quickly tipped downward in a 500 mile-per-hour nosedive into the city of London. When the plane finally broke through the clouds about a hundred feet above London, it suddenly switched directions and headed back up in the clouds at a 45-degree angle. I didn’t know why the plane had changed directions so quickly—until I looked out the window. 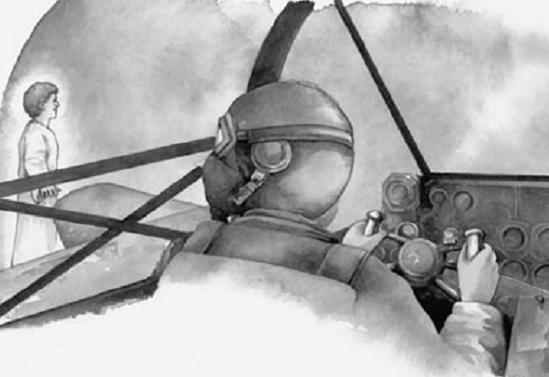 I was astonished to see an eight-foot-tall angel in a long white robe standing beside the left wing of my plane. The angel’s flowing robes and golden hair were completely unruffled and unaffected by the wind. I didn’t have much time to think about this since my plane’s instruments still didn’t work. But when the airplane reached a higher altitude, I knew I had to parachute out. I didn’t have any idea what would happen to the plane or where it might finally end up crashing. My parachute landed me in the backyard of an old London pub. The bartender, along with a crowd of people, came out to greet me with a tall mug of beer in his hands. I graciously refused the beer, explaining that I didn’t drink. Soon a photographer arrived who took a picture of me and my parachute. Then, they helped arrange transportation for me to return to my air base. The next day, my hometown newspaper in Portland, Oregon, printed that picture with an article about me on their front page. A friend saw it and took the newspaper to my wife. It was the first news my wife and mother had heard of me in many weeks. I found out later that my plane crashed in another backyard, but no one was injured. I think it all was God’s answer to the faithful prayers of my wife Harriet and my mother! Special Note: Seed Faith Books is seeking to collect 1,000 stories from Oregonians about how God has worked in their lives. How about your story? Click Here to see how to share your story and be an inspiration to others. Amateur historian Gary Richards has finally tracked down all 11 of the Camp Adair military chapels. 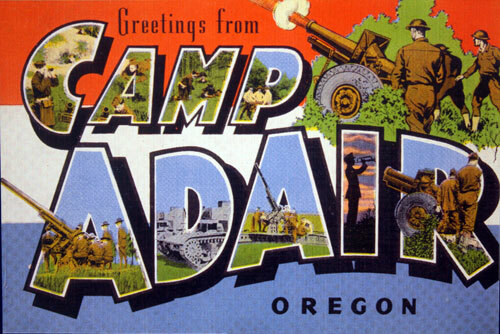 The 57,000-acre Camp Adair, which was located about six miles north of Corvallis, was built during World War II to train GIs for combat. More than 100,000 soldiers passed through the camp before being deployed to North Africa, Western Europe, and the Philippines. Before going overseas, many of the men prayed in one of these chapels. After the war, the camp’s 1,800 buildings were torn down and sold as scrap. But the chapels were set aside for use by religious organizations as either churches or war memorials. Richards grew up in a community on the northern edge of the Army base. When he and his family arrived in 1947, most of the camp had already been dismantled. About two years ago, Richards decided to find out what had happened to the chapels. After doing painstaking research he located nine. He found the tenth by following up on leads given to him by readers after an article about his search appeared in the Corvallis Gazette-Times and the Albany Democrat-Herald. Recently, he finally located Chapel 11 after he received a tip from a man in Sweet Home.